During his time in the NHL, Sidney Crosby has been widely considered as one of the best players in the league. Having being selected first overall by Pittsburgh in the 2005 Draft, Crosby arrived in the NHL with a lot of hype surrounding him, and the centre has gone on to live up to almost all of it during his time with the Penguins. While there is little doubt he is still as good as he has ever been, the 27-year-old’s lack of postseason success in recent years has seen a number of other players competing with Crosby for the label as the world’s best. There might be players who have lifted the Stanley Cup on more occasions than Crosby, whose sole championship title came in 2009, but there is plenty of evidence to strengthen the five-time All Star’s claim to still being the pick of the bunch. Despite spending the majority of his early career as a prolific scoring forward, the left-hander’s influence throughout the Penguins side has seen him drop deeper into centre, where he is able to dictate play. That change of position hasn’t had a negative impact on Crosby’s points scoring, though, with the Canadian topping the scoring charts in five of the past six seasons. If it hadn’t been for injury in 2011/12, there is a good chance he would had added to his enviable Art Ross collection. Injuries have been an issue for Crosby in recent years, restricting him to making 70-plus appearances in a season only twice in the past five years, although the last couple of years have been relatively problem-free for the Penguins star. Playing in a decent if unspectacular Pittsburgh side, Crosby’s presence in the team is crucial to the franchise’s hopes of competing in the playoffs. There is little doubt without their captain, the Penguins wouldn’t have the same Bet365 NHL betting odds of 10/1 for the Stanley Cup at the time of writing. When it comes to his offensive numbers, there have been few players in recent memory able to compete with Crosby. During the past three seasons, the centre has averaged 1.26 points per game, 0.17 better than the second most productive player at the franchise. To put that into context, the gap between Crosby and the next most consistent scorer at Pittsburgh, Evgeni Malkin, is the same difference between the second best and 15th top scorer over the course of the past three years. While the Penguins might not exactly be a one-man team, they aren’t too far off. His defensive game might not be up there with the best centres in the league, but those better defenders can’t come anywhere near Crosby when it comes to the other end of the ice. The main reason Crosby can’t clearly claim the throne as the leading player in the world is his recent record in the postseason. Drew Doughty’s two Stanley Cup wins with the Los Angeles Kings has seen some back him as ice hockey’s main man, and Jonathan Toews’ three championship titles in six years has definitely given him a decent argument to suggest he is the best in the game. 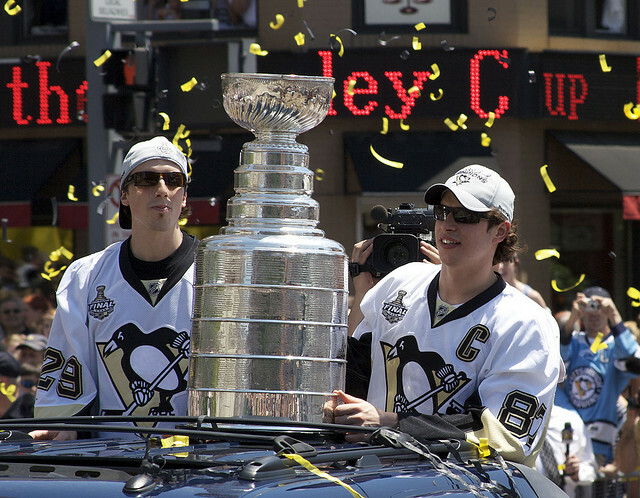 While they are undoubtedly two top players, Crosby is still the king of the NHL. The battle is now for him to start picking up the silverware he needs to solidify his place on the throne.